Another hatch bites the dust. 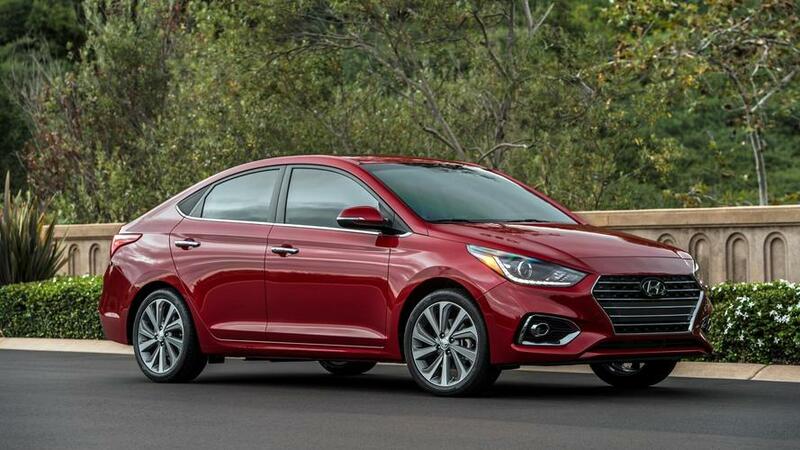 Going into its fifth generation, the all-new 2018 Hyundai Accent loses a hatchback variant, but gains a whole bunch of upgrades inside and out. The new Accent appears to take the best styling elements of its bigger brothers (the Elantra and Sonata) while adding some of its own flair. We saw the new Accent in Canada already but now have information on the American specification. 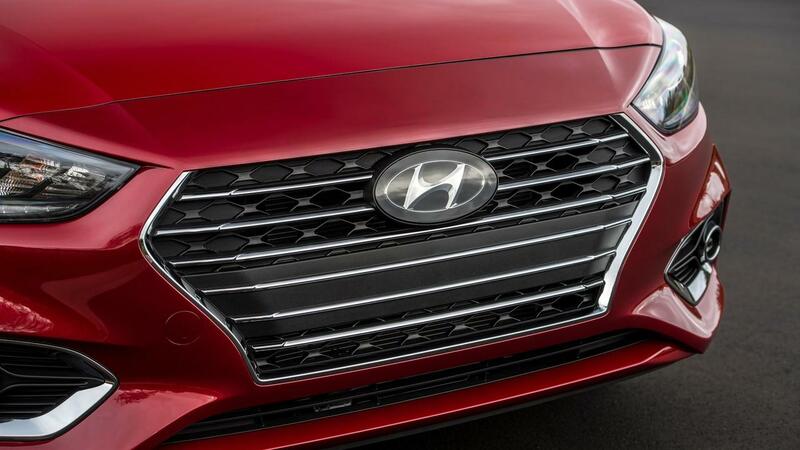 Up front, the 2018 Accent features Hyundai’s “cascading grille” flanked by new headlights with available LED accent lights. 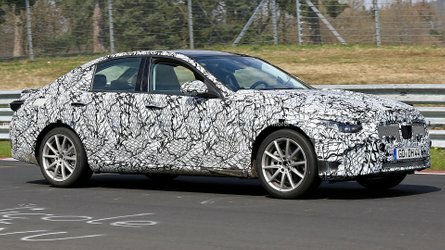 More aggressive character lines across the side of the vehicle flow nicely into the redesigned LED taillights, which are very reminiscent of the 2018 Hyundai Sonata’s units. Altogether, the new Accent looks more upscale, especially with the optional 17-inch alloy wheels. 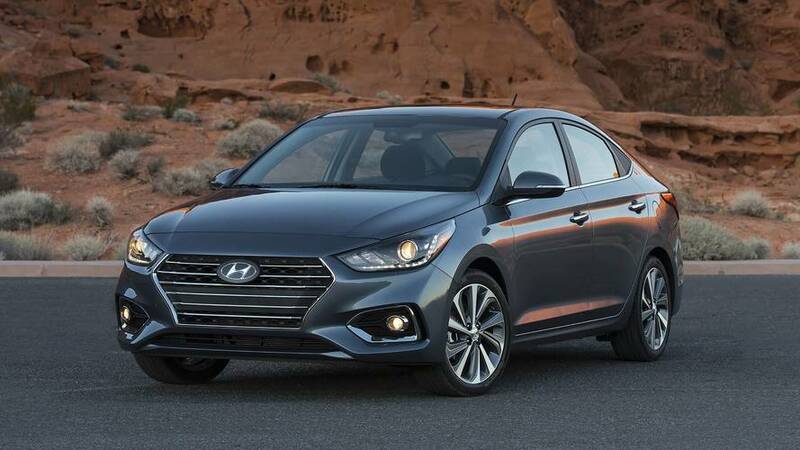 With a sculpted underside, front-lip spoiler, and lower ride height, Hyundai claims a 0.28 drag coefficient for the 2018 Accent – only 0.04 greater than the Hyundai Ioniq. Overall length and width are slightly increased over the last-gen model (0.6 inches and 1.2 inches respectively). 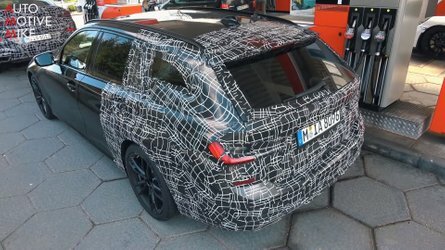 That increased width not only gives the ‘18 Accent a better stance, but is said to improve handling and interior space. 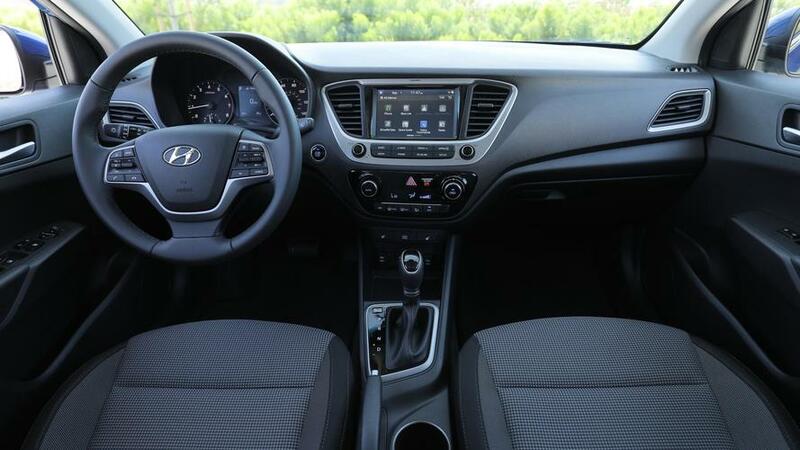 On the inside, Hyundai says the Accent employs a more “driver-oriented” layout, complemented with soft-touch materials, and new tech upgrades. Center stage, there’s a standard five-inch or optional seven-inch touchscreen. Although both setups come with a rearview camera, you will need to step up to the seven-inch unit to get Apple CarPlay and Android Auto capabilities. Below the screen there are logically laid out buttons and knobs for radio and HVAC controls. The 2018 Accent will also come with Hyundai’s Blue Link integration with Amazon Alexa and Google Home. Customers will be able to ask their in-home devices to start their Accents, and set a certain cabin temperature, for example. Total interior volume has grown to 103.9 cubic feet. 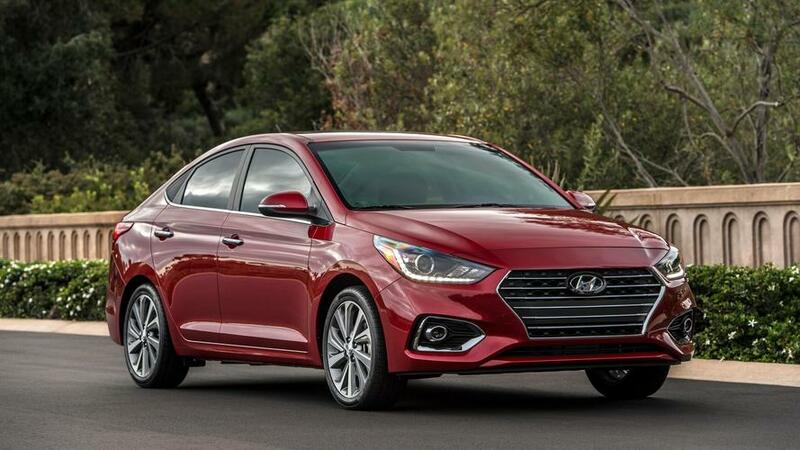 Hyundai claims that figure now classifies the Accent to the EPA as a compact car, versus a subcompact car. New safety tech includes six airbags, and a forward collision-avoidance system that utilizes a front forward facing radar to apply emergency braking if the driver doesn’t react. The ‘18 model’s body structure is also made up of 54.5 percent high-strength steel (13 percent more than the last-gen) to improve the Accent’s torsional rigidity by 32 percent. Hyundai says more extensive use of this material improves collision energy management, noise isolation, and overall driving dynamics. Under the hood, an updated 1.6-liter four cylinder engine produces 130 horsepower and 119 pound-feet of torque. Hyundai said engineers adjusted the engine’s powerband, and increased the amount of low-end torque to make it easier to drive in city conditions. Fuel efficiency is also said to improve by seven percent, but official fuel economy numbers have not been released. Customers can either choose from a six-speed manual or automatic transmission. The redesigned auto-box is also four pounds lighter than the unit it replaces. The 2018 Hyundai Accent can be seen at the 2017 Orange County International Auto Show, and will hit U.S. showrooms later this fall. Official pricing has not been released, but expect it to start around the same $14,745 base price of the ‘17 model. Anaheim, Calif., Sept. 28, 2017 – Hyundai Motor America debuts the all­new 2018 Accent at the 2017 Orange County International Auto Show. The 2018 Accent enters its fifth generation by building on the strengths of its predecessors with Hyundai’s modern engineering prowess. 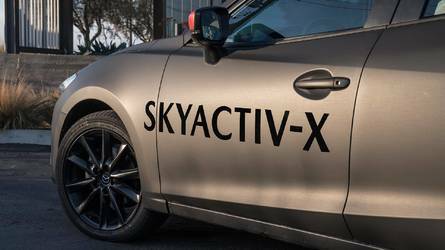 The result is a car with an expressive design, a high­tech interior, a more efficient powertrain, reduced cabin noise and remarkably improved driving dynamics. The company also infused its newest subcompact car with the latest safety and convenience features. The 2018 Accent will arrive in Hyundai dealerships in the fall of 2017. The all­new Accent was developed to be the segment benchmark for driving dynamics and safety while delivering outstanding fuel efficiency and maintaining Hyundai’s unbeatable value position. Key to achieving those goals was the car’s use of Advanced High Strength Steel. Accent is composed of 54.5 percent Advanced High Strength Steel—up 13 percentage points from the fourth generation—from the company’s captive Hyundai Steel plant. 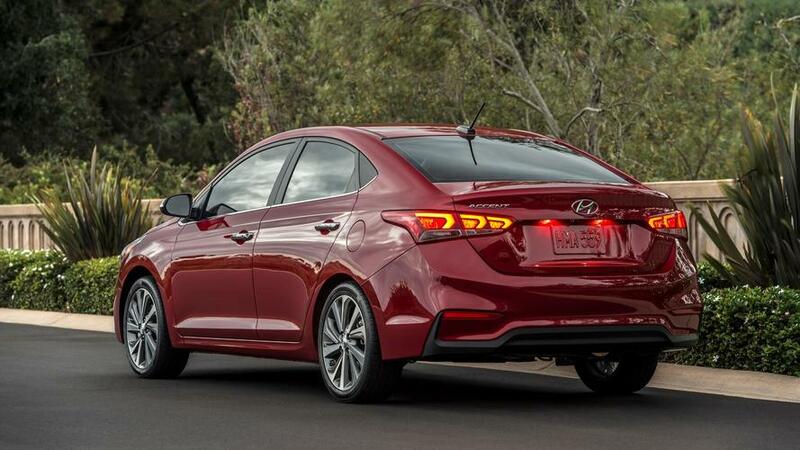 In addition, Accent’s torsional rigidity improved by 32 percent. Improved ride comfort, handling and stability are achieved through key developments in the suspension. Accent’s steering feel has been refined with improvements to steering efficiency, while enhancements to handling and ride comfort have been made by raising the rear roll center and increasing the leverage ratio of the rear shock absorbers. The standard Motor­Driven Power Steering (MDPS) system instantly adjusts to changing driving conditions for greater precision and steering feel while improving fuel economy. Accent’s sweeping roof profile and sharp character lines run the length of the car. These character lines meet available slim LED wraparound taillights. Features such as 17­inch alloy wheels and side mirror LED turn signal indicators add to the upscale feel of the car. The car’s form is also functional, achieving balance between design and engineering for standout styling with aerodynamic improvements. The underside of the car is also sculpted for aerodynamics, and a new front­lip spoiler, together with a lower ride height, contributes to Accent’s efficient design. All of these attributes allow the 2018 Accent to slip through the wind with a 0.28 coefficient of drag. Accent’s interior continues the modern, confident, sophisticated look seen on the exterior. A driver­oriented layout with intuitive controls combines with improved interior roominess, high­quality materials and premium technology features to raise the standard for subcompacts. Premium, soft­touch materials in key points create an inviting and comfortable environment for the driver and passengers. A wide instrument panel prominently features a standard backup camera system with a 5­inch or optional 7­inch color TFT LCD display. Beneath the screen, the control panel is laid out in a horizontal design with buttons and controls logically grouped by function. The seat frame is engineered to be lightweight but extremely strong, to help keep occupants safe in collisions. For added comfort and convenience, passengers enjoy available heated front seats, while the standard rear seats fold with a 60/40 split. Accent also offers class­above total interior volume. Accent sedan passenger volume has grown to 103.9 cubic feet. With this figure, Accent is actually classified as a compact car, versus a subcompact car, according to the EPA. In fact, Accent has more interior and cargo volume than the Ford Fiesta and Toyota Yaris. For 2018, the new Accent receives an updated powertrain tuned for better fuel efficiency and drivability. 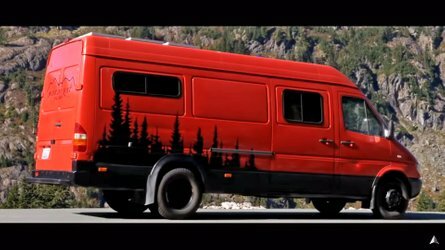 The updated 1.6­liter Gamma four­cylinder Gasoline Direct Injected (GDI) engine produces 130 horsepower and 119 lb.­ft. of torque. Compared with the previous­generation Accent, the engine’s powerband has improved, with increased low­end torque to make drivability easier. The 1.6­liter Gamma four­cylinder GDI engine is paired with either a six­speed manual transmission or a six­speed automatic transmission. Fuel efficiency has also been improved by an estimated 7 percent overall. In the engine, components such as low­ friction piston rings, a variable fuel pressure module and upgraded software for the engine control module improve overall operation. Further, improvements to the return springs in the braking system have reduced drive friction. 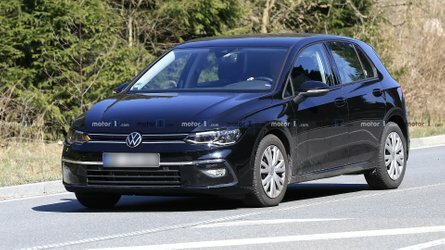 The automatic transmission has also been redesigned to reduce the unit’s overall weight by 4 pounds and improve operational efficiency. A six­airbag system is standard, along with Electronic Stability Control, Vehicle Stability Management, Traction Control and ABS. New for 2018 and for the segment, Accent offers a wide array of advanced safety technologies to provide another layer of protection for passengers. For example, Accent offers available Forward Collision­avoidance Assist that utilizes a front forward facing radar to detect a vehicle and warn the driver of a potential collision. If the driver does not react to avoid the impact, the system will apply emergency braking. protection for passengers. For example, Accent offers available Forward Collision­avoidance Assist that utilizes a front forward facing radar to detect a vehicle and warn the driver of a potential collision. If the driver does not react to avoid the impact, the system will apply emergency braking. Most 2018 Accent trims will feature technologies ahead of the subcompact competition that enhance driver confidence and convenience. For example, Accent offers a proximity key with push button start, so drivers never need to pull out a key from their pocket or purse. Accent offers available dual USB charging and auxiliary input jacks and available SiriusXM satellite radio. New for 2018, Accent has an available advanced infotainment system that includes a 7­inch Display Audio touchscreen system and rearview camera. 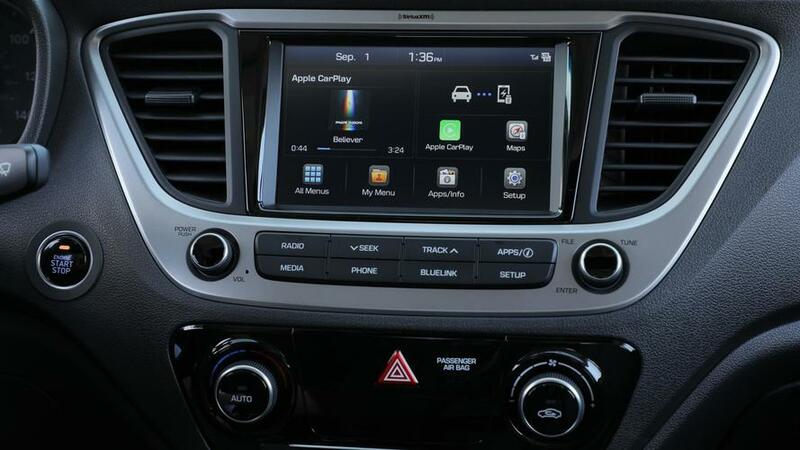 The 7­inch display also has both Apple CarPlayTM and Android AutoTM for seamless and intuitive operation of the most commonly used smartphone functions, including app­based navigation, streaming audio and voice­controlled search capabilities. For the ultimate level of convenience when it comes to remote­starting a car on a bitterly cold winter morning, Hyundai has its new Blue Link integrations for Amazon Alexa and Google Home. These integrations work by a customer simply asking an Alexa­enabled or Google Assistant–enabled device, like an Amazon Echo or Google Home, to start their car. The interaction actually sounds like this: “Alexa, tell Blue Link to start my car at 80 degrees” or: “Okay, Google, ask Blue Link to start my Accent and set the temperature to 72 degrees.” To send commands to Hyundai vehicles via Alexa or Google, users must enable the Blue Link integration in their Alexa or Google Home app, available on iOS and Android devices, and then link their existing Blue Link account within the Alexa or Google Home app. Voice commands will be sent to Hyundai vehicles only after Alexa or Google Home prompts owners for their Blue Link Personal Identification Number (PIN). Hyundai Motor America, headquartered in Fountain Valley, Calif., is a subsidiary of Hyundai Motor Company of Korea. Hyundai vehicles are distributed throughout the United States by Hyundai Motor America and are sold and serviced through 835 dealerships nationwide. All new Hyundai vehicles sold in the U.S. are covered by the Hyundai Assurance program, which includes a 5­year/60,000­mile fully­ transferable new vehicle limited warranty, Hyundai’s 10­year/100,000­mile powertrain limited warranty and five years of complimentary Roadside Assistance.